New, compact & rugged design holds up to the work environment where barriers are used. • New, compact & rugged design holds up to the work environment where barriers are used. • Handles concrete barriers from 6” – 12” nominal width at the top of the barrier. • Stainless steel Auto-Latch.• Auto-Latch mounting insures proper alignment. 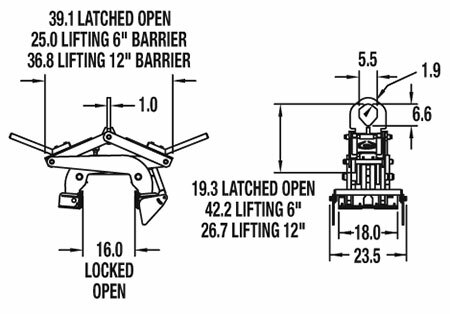 • Locating assembly orientates tong on barrier without operator intervention and will pivot whengrab is set on the ground. • Gripping pads pivot to conform with the load. • Replaceable polyurethane pads protect barrier. • Alloy steel dog-point pads bite into painted barrier surfaces (typical in coastal areas). • Centering guide cut out on grab shoe helps to properly center tong over barrier for a level lift. • Extended handles on each side keep operator away from load and can be adjusted as needed. • Lifting eye allows for easy hook attachment,self-centers rigging, and will accommodate a fork.